It took me completely by surprise when Miss E became afraid of the dark at about 2 years old and wanted a nightlight. I wasn’t prepared for it and thought it would pass quite quickly. But here we are, 6 years later and she still doesn’t like going to sleep in complete darkness. It makes sense really, we aim to keep them feeling safe and secure in the daytime and then at night, we turn out the lights, close the door and leave them completely on their own for 12 hours. It’s no wonder that if they wake they feel a little lost, alone and scared. 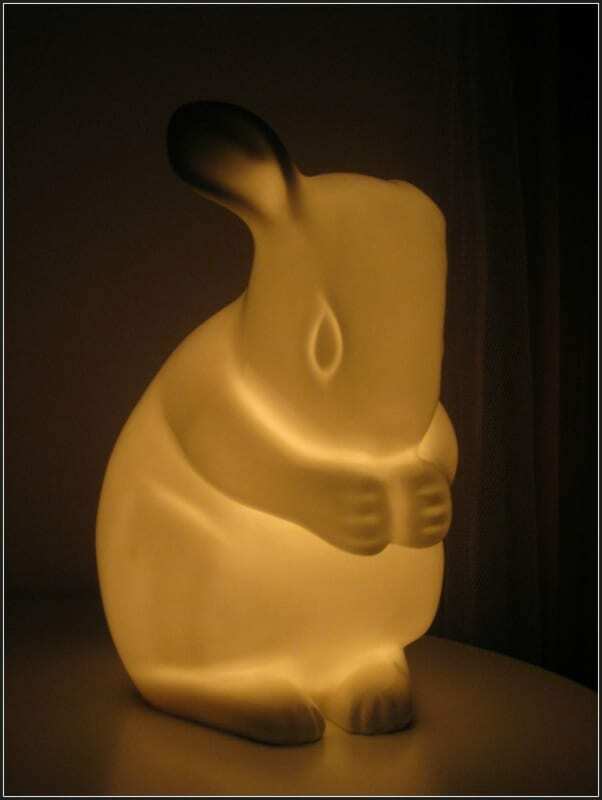 We’ve had a Disney Princess nightlight for some time now but she’s growing out of that quite quickly, and had been asking for something more grown up, so when I was asked to review the White Rabbit England Rabbit Lamp I was interested to see if this did the job for her. The design is beautiful; sleek, stylish and minimal and it’s no wonder that it has been shortlisted for the ‘Junior Design Awards 2012’. It’s much larger than I imagined it was going to be too. The comforting glow at night is just right, and it leaves the room feeling warm and cosy. 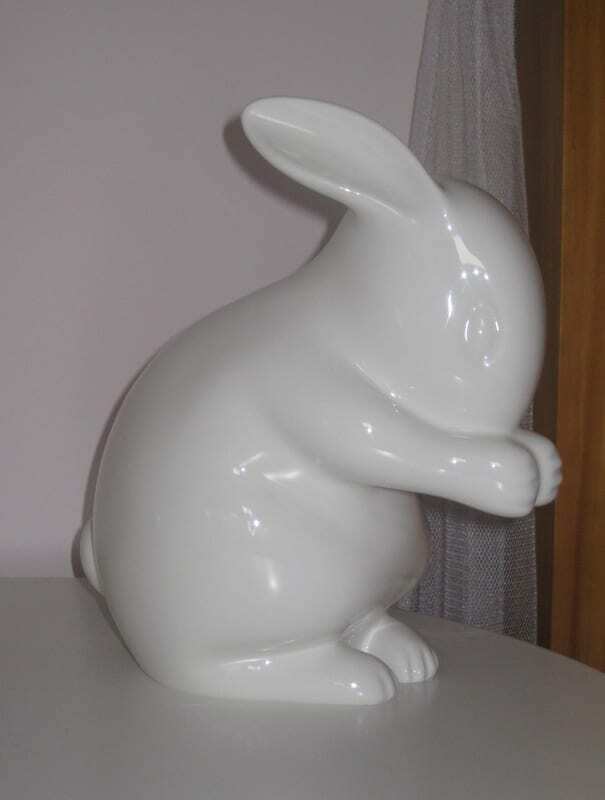 We love that his one ear stays black even when he is turned on and even though it is made of Bone China Miss E says to her, it feels soft and she strokes him lovingly before she goes to sleep. She has a deep attachment to Mr Rabbit already which is gorgeous to see but I just hope she doesn’t ask to take him on holiday or we’ll be looking for a special transportation box. The downsides? Well it isn’t something you will buy on a whim at £60. But having said that, it is a beautiful gift, maybe for a birthday or Christening and will last for years. I would buy this for a baby or a 10 year old girl, maybe more than a boy, so well done to White Rabbit England for a product that crosses different ages. 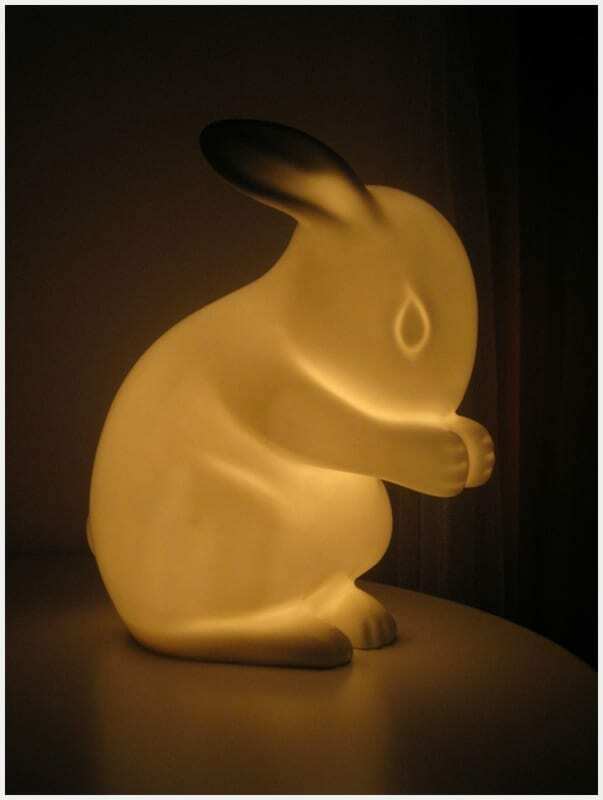 The White Rabbit England Rabbit Lamp is available on the White Rabbit England website and retails for £60. I was sent the Rabbit Lamp free of charge for the purposes of this review. The opinions and comments are genuine and my own. I absolutely love it, in fact in the end I decided to use it as my bedside light! The quality and design is fantastic! I agree suitable for a baby, an older child or me! !